Amazing glass work and reflections. Lovely still life work, Shirley! 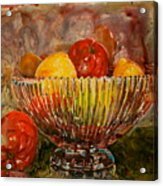 I invite you to post this fine piece to the Amazing Still Life Art Artwork Group. It will surely make a great addition to that Group. F/L I just love your art - so much talent and creativity! The work on the glass bowl is fantastic! Thank You CJ! Much appreciated. 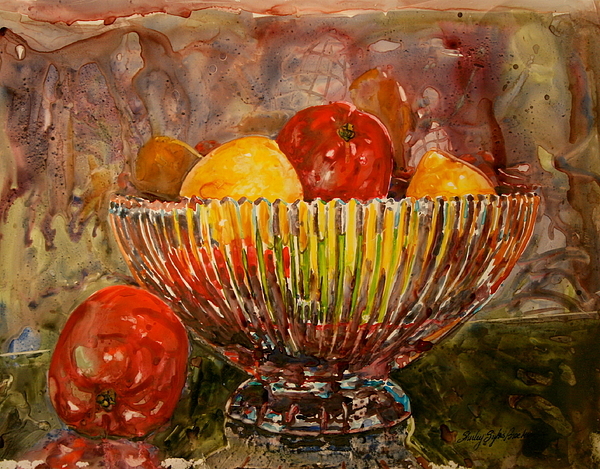 This painting was inspired by the Crystal Bowl given to me by my mother. I have filled it with different fruit and painted it many times. I'm sure I will be painting it many more times too. This particular painting was done on Yupo paper. 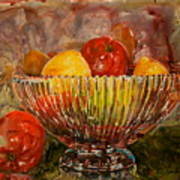 Shirley Sykes Bracken is an award winning watercolorist and sculptor. My watercolor paintings begin with color and chaos. And then I push them towards reality. It's an interesting process. It takes hours and hours to make them bloom like I want them to. Flowers are my interest. My style is my own! PRINTS are available here on Fine Art America. If you are interested in purchasing the ORIGINAL, contact her at www.s.bracken@mac.com All copyrights apply.